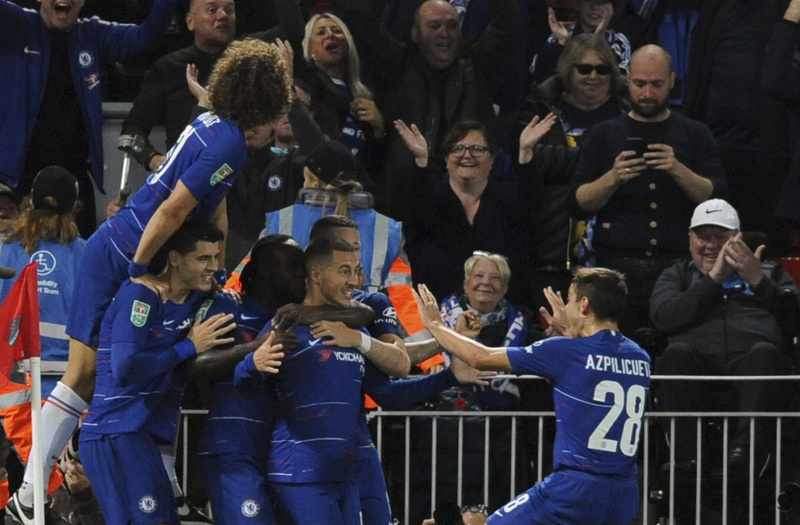 LONDON (AP) — In a formidable display of skill and speed, Eden Hazard slalomed past Liverpool players before scoring the goal that sealed Chelsea's progress in the League Cup. The winger's sixth goal in seven appearances ended Liverpool's perfect start to the season with a 2-1 victory on Wednesday at Anfield. And the teams have a swift reunion, with Chelsea hosting unbeaten early front-runner Liverpool at Stamford Bridge in the Premier League on Saturday. Emerson Palmieri leveled after Daniel Sturridge gave Liverpool the lead in the 58th minute before Hazard's mesmerizing winner in the 85th minute. The Belgium winger went past two Liverpool players around the halfway line before sending the ball through Robert Firmino's legs to Cesar Azpilicueta on the right flank. The Spaniard returned the ball to advancing Hazard, who went past three players, cut inside and sent a shot across goalkeeper Simon Mignolet and into the net. "For sure it's on top of the list (of goals) also because it's Liverpool," Hazard told broadcaster Sky Sports. "When I received the ball I just looked for one, I see on my own so I just tried to do what I can do and I did well so we can go through." Dele Alli enjoyed a dream return to Milton Keynes with Tottenham against Watford. The home of MK Dons, Alli's former club, is being used by Tottenham in the League Cup because its new stadium at White Hart Lane is not ready yet. Alli sealed a 4-2 penalty shootout after a lively finish saw the game end 2-2 after 90 minutes, with extra time not being played in the competition. Erik Lamela then put Tottenham in front, only for former Spurs player Etienne Capoue to level with a heavily deflected effort. After goalkeeper Paulo Gazzaniga saved from Capoue and Quina, it was left to Alli to send his side through. Arsenal cruised through with a 3-1 victory over second-tier side Brentford with a double from Danny Welbeck and Alexandre Lacazette netting in stoppage time. West Ham routed fourth-tier side Macclesfield 8-0.